Designed to soar, this kite also makes eye-catching decor in between flights. Easy to put together. Looks just like the picture. A little bigger than I expected but we love it. Looks magical and flies easily. Very sturdy as well. This was an absolute hit for a gift! 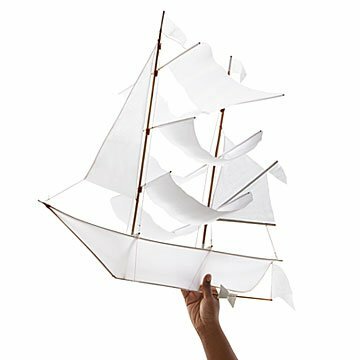 My husband loves the sailing ship kite. We were away from home at Christmas. When returning on the airplane, he brought as his carryon cause it did not fit in his suitcase. As soon as we returned home he began constructing the kite. Best gift - ever!!! I didn't put it to the rigors of flying as it will be for decoration only; however, it feels very sturdy. Perfect gift for a "kid" in his fifties! Cannot wait to pack a picnic this spring and launch this ship with my retired naval officer hubby! The site was easy to maneuver through. I found just the right thing for my daughter and the purchasing process was simple. It is everything I hoped it would be when I ordered it and the icing on the cake is that it arrived on the exact day it was expected. No surprises, no headaches. A wonderful experience that I plan to repeat in the near future!! I believe my husband will fly the kite, he has not unwrapped it as of yet. I haven't given it to him yet, but it looks really neat and I'm excited to display it in our home and fly it when we go on our next beach trip.